OECD inflation has been rising, but it recently has stabilized. 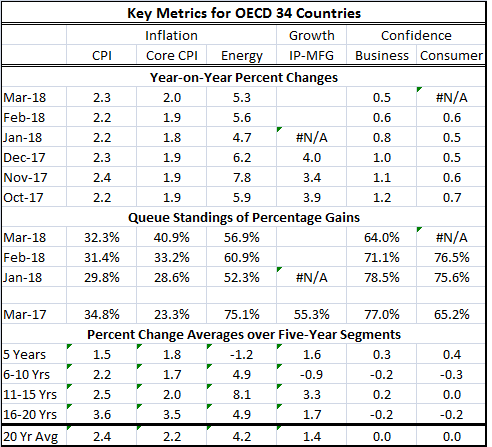 The pace of OECD inflation is at 2.3% having peaked at 2.5% in February 2017. The core rate of inflation is creeping higher and is up to 2% in March; that’s an acceleration of sorts, but it was at 1.8% in July 2017 so it has crept up very slowly. The inflation environment remains very subdued. OECD business and consumer confidence measures are substantially up to date. Confidence metrics for businesses and consumers are in the 65 to 75 queue percentile range, modest firm but not strong. Until recently business confidence has been a bit less than twice as fast as consumer confidence. In the last several months, business and consumer confidence are rising at about the same speed as business confidence which has slowed to the pace of consumer confidence’s gains. Industrial production data for the OECD area lags. But as of December, IP was growing at a 4% pace in the OECD area. It’s no wonder there is such a flash point around trade and the potential to disrupt it with tariffs. Since trade is mostly trade in goods, it is trade that is fueling the gain in industrial output that is so much faster than GDP growth. International trade has ‘always’ grown at a faster pace than GDP. If trade is disrupted, industrial output and GDP will slow. The United States and China are currently engaged in negotiations about how to make trade with China fairer. And in these talks, China is seeking greater access to U.S. markets as well in terms of being able to acquire tech companies; it also wants its tech companies to face fewer restrictions even though some of them have been redlined over very real national security concerns. China is a Communist country and it exerts a great deal of influence across companies that operate there. It needs to come to terms with how that causes other nations to look at it and treat its emissaries of trade. 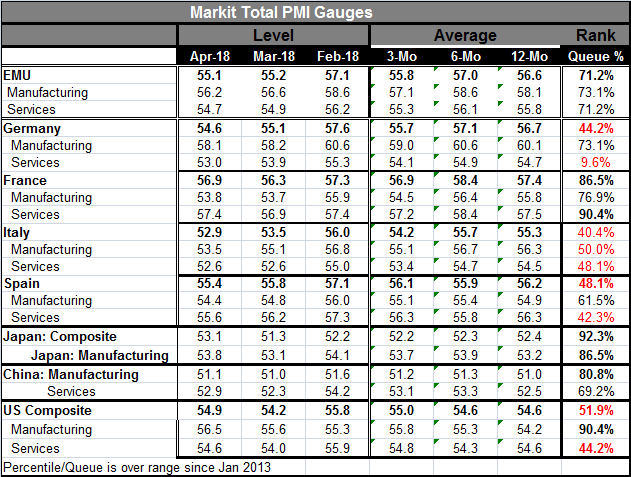 The finalized PMI gauges for the EMU and few other countries show some remarkable if inconsistent weakness cropping up in the services sectors. Just a few short months ago, most of the EMU gauges were pushing queue standings in their 90th percentile- more or less across the board (German services sector excepted). Now the EMU is showing much lower standings and diminished momentum. The EMU shows a composite gauge, manufacturing and service sector with PMIs sitting in the low 70th percentile range. This is despite Germany with a large weight in the EMU at a 44th percentile standing for is composite and a services sector standing in its lower 10th percentile! Italy shows all of its readings at or below their respective 50th percentile standings. Spain shows services below their median with a 42nd percentile standing. France alone among the big four economies has firm-to-strong standings for all sectors. Japan and China both show firm-to-high standings for their PMI metrics but do so on low diffusion values. Their rankings stem from the fact that their economies are slowly progressing and in the last five years conditions have been so weak that the current low diffusion values seem strong by comparison. On balance, there is a lot of weakness in the international mix. This brings us to retail sales. And here we find the EMU in a much weaker position. Euro area retail sales are falling in volume terms in Q1. Growth on all horizons is below 1% (annualized!). Economic growth typically is led by consumption. Firms invest so they can sell more to consumers or so they can sell more consumer goods-making equipment to firms who sell to consumers. Consumers are the end game. When everyone is investing in capital equipment or in the means of production and no one is consuming the economy develops an imbalance, inventories pile up, and recession could follow. This particular phase of the global business cycle puts those sorts of concerns in play. Asia is very fast growing and more concerned about producing than consuming. Consumption has slowed in Europe. In the U.S., the usual consumer paradise, consumption has failed to respond to tax cuts and has slowed early in the year, creating some head scratching about what comes next. In Europe, Germany is reacting to the high bill for caring for migrants. That has absorbed so much funding that Germany is cutting back on infrastructure spending and prioritizing running a budget surplus. Germany has said it once again will miss its 2% defense spending obligation for NATO. That could create more tension with the U.S. since U.S. President Trump made such a big point to this when he was first elected and Angela Merkel treated him so badly for that pressure. Now despite having seen how high a priority the U.S. places on Germany carrying its own weight, she wants to stiff him as Germany has stiffed a long line of U.S. presidents that asked Germany nicely to pay its own way. Germany will be no source of consumer strength, as it cuts back. The April U.S. jobs report is now a thing of the past and in many ways it seems even weaker than its somewhat disappointing headline. The U.S. unemployment rate is dropping, but wage gains are muted and the creation of full time jobs is actually very weak. The breadth of U.S. jobs gains has narrowed, too. Central bankers have a one-track mind. They are anti-inflationist. Even in the U.S. where the central bank has a dual mandate, the bankers always seem to see more inflation risk. In Europe, the ECB is well away from its inflation target and still there are pressure on it to dismantle some if its stimulative programs. But what we see is a loss of economic momentum in a number of ways. Oil’s gyrations can inject a ‘pulse’ of inflation here and here, but on balance there is little inflation brewing. There is a slowing in economic activity evident in the PMI gauges and in retail sales trends in Europe. Globally inflation is muted and steady. Consumer spending prospects seem dodgy at best. And no one seems to have any concern about the weakening trends in activity even though these trends have been supported by the unusual degree of stimulus that central banks have provided. No one seems to think that pulling out this stimulus will have any impact on growth. Why? Why: because they are focused on inflation.